1. Start by adding a normal one-time event. Go to your club calendar on the NSN. 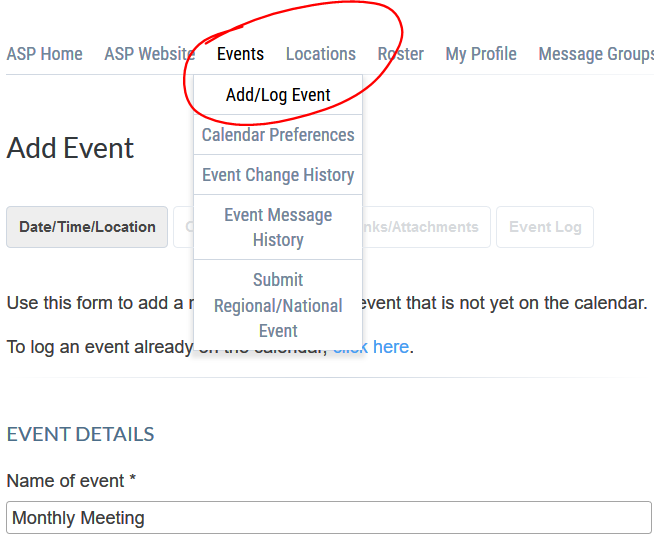 Click on Events, then select Add/Log Event from the dropdown. Create a new event for your monthly meeting or event by adding all of the details on the form. Remember to click on Submit at the bottom or click on Next to add more details, such as flyers, RSVP options, and links. 2. Click on Submit when finished. If you want to send a message out to the membership, you can do that now. However, click Skip Message for now. The next page that opens on your screen will display your finished event. 4. You'll find a variety of options to choose from in this section. You can adjust those options using the arrow symbols next to any of the options to choose the perfect selection for your club's scheduling needs! 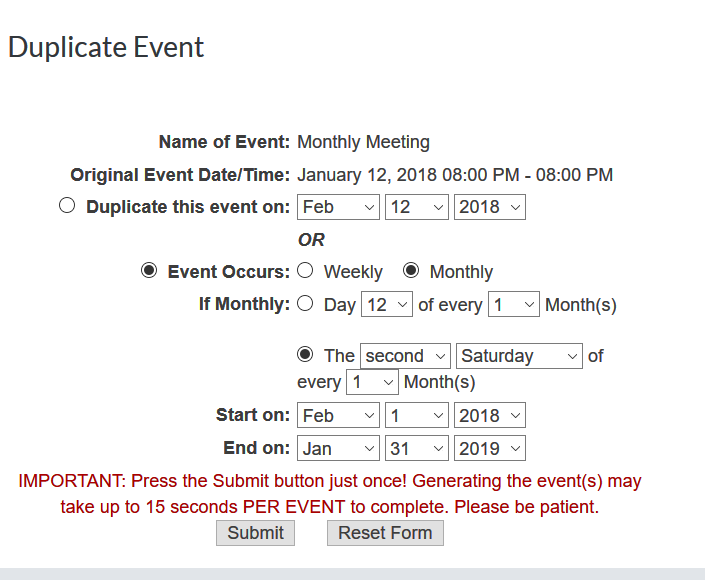 Remember to select the date for your next upcoming meeting in the Start On area near the bottom, since you already created the first event. If you know your club will have these events throughout the year, use the End On option to pick a date for your last meeting of the year. 5. Click on Submit. Click Submit just once and be patient while the system adds the event throughout your calendar. This may take a couple of minutes to process, and while doing so the system may appear to be stuck. Don't click on Submit again, or you may double or triple your meetings! Your calendar should have your event posted for each month from the first date you posted to the last. 6. Congratulations: you have scheduled multiple events to your club's NSN calendar in just a few minutes! Make sure to check these events and edit them in case they conflict with holidays or other important events. This will save you a good deal of time later on and make it easier to report on them in the event log system after they have been held..